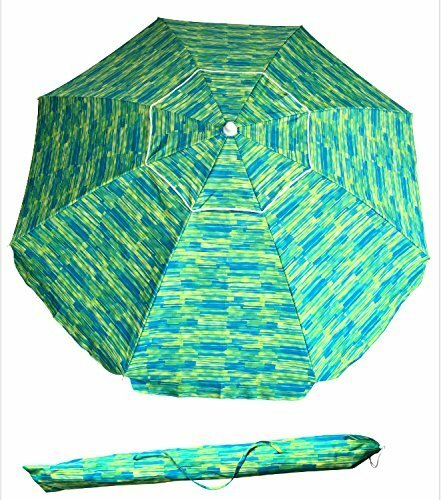 This beach umbrella helps protect you from the scorching sun, blowing sand and more.Large 7'/ 2.13 meters sand anchor beach umbrella diameter, light-weight, Strong aluminum top pole and strong steel bottom pole with zinc tilt,8 fiberglass ribs provides enhanced durability and extended protection, Oxford fabric with coating which protect from over 95% of ultraviolet rays. Integrated sand anchor secures your umbrella with a simple twist. Integrated sand anchor secures your beach umbrella with a simple twist. Strong aluminum top pole and strong steel bottom pole with zinc tilt,Extra strong 8 fiberglass support ribs , resist wind better, Last longer. If you have any questions about this product by SueSport, contact us by completing and submitting the form below. If you are looking for a specif part number, please include it with your message.